It happened to me, or I should say, to my friend, on a visit to Germany a full 20 years ago. My friend was in school in Heidelberg to work on her already-good language skills and figure out what came next for her. I’d come with my boyfriend to visit her and tour the lovely old city. She met us at the train station and took us around town for the afternoon. We rode the quaint local trolleys through the city, and I recall her handing us small paper tickets that we were supposed to punch in some ancient contraption in the rear of the car. To make the tickets last longer, she said, we don’t have to punch them; it’s an honor system here, and they rarely check. You see where this is headed. Sure enough, a train representative boarded before our stop. He asked for the tickets of the people seated in front of us, and they produced theirs without incident. He came up to our little group and asked for our tickets; she produced them but they weren’t punched. She pleaded ignorance but her German was too good. I couldn’t understand his words but I could understand his tone, and he quickly discerned that she had been here long enough to know how the system worked. He berated her in front of all the other passengers, and she hung her head and I saw tears coming down her cheeks, and we all felt miserable about the whole thing, our little attempt to save 75 cents, our outing dampened considerably. It was one of those awful moments you’d give anything to undo. Fast forward to 2013. I am married to a flouter of authority. If you know M you know exactly what I’m talking about. You could imagine that perhaps he is willing to push the boundaries a bit on something like tram tickets. I have told him my cautionary tale, and since we’ve arrived I’ve seen many more train conductors enter cars at random and check others, and check my card as well, and everything has always been in order. There are so many temptations in an honor system. You hate to pay the full fare to travel just five stops when there’s a cheaper pass you could buy for three stops; I mean, what are the chances you’ll get checked? Constantly weighing the odds, that’s what’s happening around here. Last week we had dinner at a friend’s apartment in Kreuzberg. Coming home that evening, we were one ticket short. Mine. M said don’t worry about it, it’s just five short stops, and besides, the train is coming and if you stop to buy a ticket we’ll have to wait another 10 minutes. I followed my family on board, the girls with their monthly passes, M carrying the one we share. I must have looked like I swallowed a canary because M said “Stop acting so guilty!” But the memory of the Heidelberg incident loomed large in my mind. A few stops in, I saw two men climb aboard the front of our car in matching dark blue sweaters. My stomach lurched. “I’ll see you at home,” I whispered to M, and I stepped off the train and onto the platform, the train doors sliding shut behind me, leaving M to explain to our tired and confused daughters where I was going. As the train pulled away I felt shocked at the choice I’d just made—to leave my family suddenly out of a fear of the authorities, the fear that I could be the one berated in front of the whole car of passengers and my kids as well. I walked down the platform to the yellow BVG machine and bought myself a ticket for the remaining stops home. I felt much better about myself as a citizen but much worse as a mother. I caught the next train home and met them at the flat, M laughing off my fear, telling me those weren’t conductors at all. The kids were remarkably unscarred by the incident. Yesterday was M’s turn to panic. He had taken the girls out to explore the medieval castle and grounds in Spandau, leaving me home to work. Together they’d been all over the west and southwest of the city on the subway. They were on their final train coming home, having traveled a whopping 44 stops by then, they’d just tallied up, when a conductor came on and demanded to see everyone’s tickets. M had tickets for everyone, but E’s was within five minutes of expiring. You’re not allowed to make a round-trip on one ticket, and they hadn’t, but the circuitous nature of their afternoon made it obvious they’d milked that ticket for all it was worth. The conductor reviewed the details carefully, then handed the tickets back to M with a grunt and moved on. All clear. Everybody breathe. When M came home and told me about this scare, I was secretly glad—glad we were agreed that being found on the wrong side of this law is not worth contemplating. Especially in front of the kids. Our nearly fluent little E would be the one to understand and absorb every last insult. 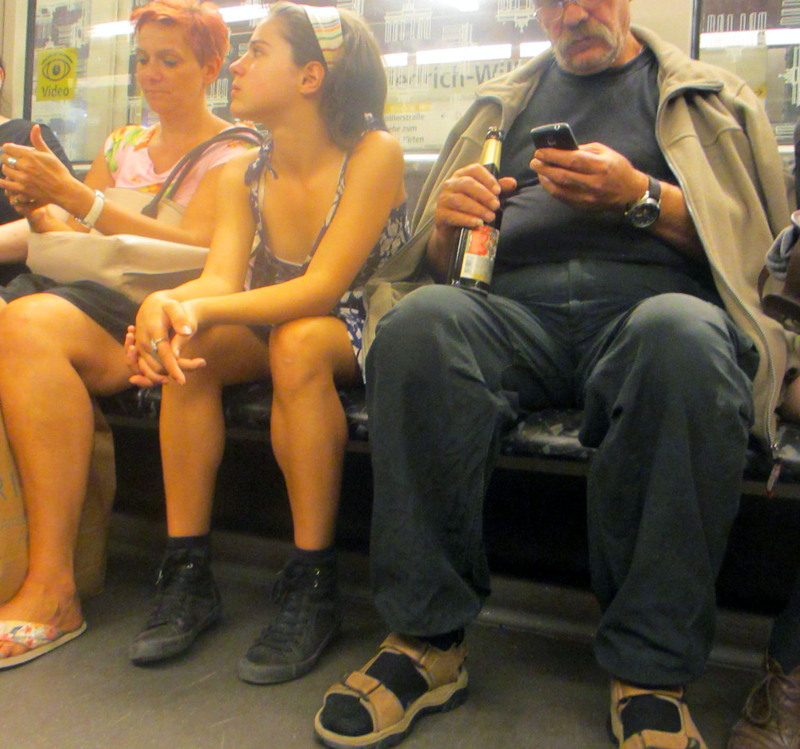 This entry was posted in City life, Public transportation and tagged Berlin, Heidelberg, Kreuzberg, schwarz rider, Spandau, subway, Tickets, U-Bahn on October 1, 2013 by Jill M..
Hi C! Sere misses you! Comedian Drew Portney put it this way: In US cities you’re scared to get shot, in Berlin, Germany the worst thing that can happen to you is: “Fahrkartenkontrolle”.